A recent study listed the seven things the middle class can no longer afford, including dental work, medical care, new cars, and retirement savings. 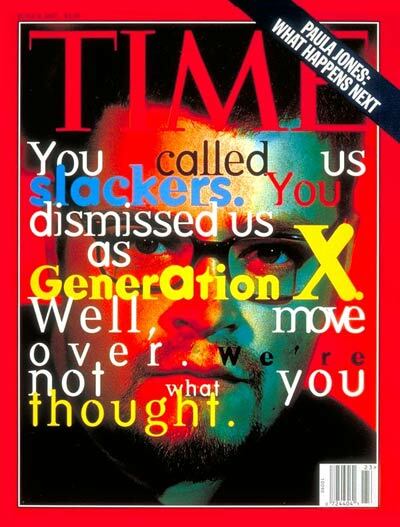 Most of this stuff has become unaffordable to Gen X/Yers and, consequently, has us blaming the Baby Boomer generation, accusing them of mass selfishness and vapidity. That, however, is not entirely fair. We, as a generation, need to look in the mirror. Here are some things we are blaming the Boomers for, and why we need to get over ourselves rather quickly. Why we are blaming boomers: This is an easy blame assignment; they frittered away our economy with selfish entitlement attitudes and the notion that Wall Street was one massive casino where the “house money” was theirs to do with as they pleased. Now, the belief is that they should be to work as long as they want, reinvent themselves, and that they can “find themselves” again in their own retirement. There is a pervasive attitude among many of them that Gen X/Yers are there to serve them, and that we can essentially take a flying leap about our own concerns. Why we need to get over ourselves: Gen X/Yers are no stranger to the “we’re better than you,” mentality – even we have our share of darwinists who need to have their egos busted. As we have been humbled, we’ve improved, and that humility will continue to serve our generation well, and it’s what will redefine us as the generation which not only saves the day, but saves the world from, well, itself. Why we are blaming boomers: Most of Madison Ave., Wall Street, DC, and Hollywood is run by Baby Boomers now, so the association between their generation and the declaration that Millenials are better than Gen X/Yers is easy to see. We are shoved aside because we were once viewed as slackers who now talk back, disagree, question everything, and aren’t good little boys and girls when it comes to getting lockstep behind political leaders about ideological issues. In other words, we are the “gutless wonders” who Boomers in political power now talk about. Don’t forget, Rush Limbaugh, Sean Hannity, Hillary Clinton, Chris Matthews, et al, are all Boomers! Why we need to get over ourselves: Everything which drives Boomers crazy about us is our core strength, and it all flows from one quality – we think for ourselves. Critical analysis, questioning everything, and being able to actually put together a cohesive argument is what is going to make our generation one of elder statesmen WAY before our time. Listen, fellow X/Yers: get ready, and used to, being looked to for advice, support, wisdom and real leadership – unless these generations get their act together, that’s our destiny. Why we are blaming boomers: Who else is there to blame? Medicare, Social Security, pension guarantees, robbing the treasuries of these programs to pay for pet projects…these are all under the purview of retiring boomers who believe since “they worked for it,” they are owed it. The government, of course, is not going to bite the hand that feeds them with votes. Why we need to get over ourselves: WE AREN’T VOTING! We don’t want to tackle the hard issues. Does this mean we need to privatize everything? Absolutely not! What we need to do, as a generation, is root out the systemic corruption which started at the outset, was watered by the Boomers, and enabled by ourselves and Millenials. We are known for flying by the seat of our pants, and somehow making it work. We must employ this attitude in everything we do when it comes to devising solutions. We are as guilty of this stupidity as anyone and until we become determined to simply step into our and do what we do best – flip the bird at Boomers and do it “our way” – this crap will continue. Here’s what it all comes down to, fellow X/Yers – nobody is going to give is anything, period. Millenials, and those who come after them, will be looking to us for leadership and vision after they make a billion wrong turns on their collective walkabout. Baby Boomers are still on this walkabout, but that’s merely because they themselves were enabled by a culture which said “if it feels good, do it.” Time Magazine contributor Sara Robinson, in a April 2014 piece, put it in an extremely elegant way. While ours was the generation was the one which grew up with the ebb of the space program, the rise of AIDS, and the spectre of nuclear holocaust, it was also the one which can take the world we live in and, through noble and wise leadership, can truly become the generation which takes command, leads and guides and, most importantly, nurses the world back to health for future generations. We may even (gasp!) be able to impart some of our own wisdom and calculated risk-taking attitudes on said posterity. So, Gen X/Yers, consider this our clarion call – let’s get over ourselves, and do what we do best: renew, restore, and rebuild. Fifteen things men need to start doing right now. ← Great (and not so serious) reasons to bring back Florida’s colored highway signs. Thanks for this great post. A perfect insight. Sharing the word.